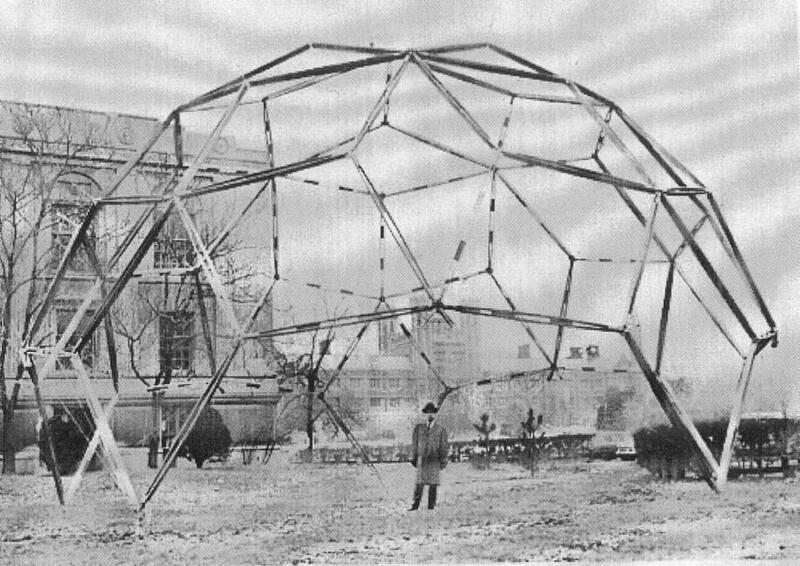 In a sense, Shanghai has always been a testing ground for experimental urbanism. In the years following the 1842 Treaty of Nanking, the lands outside of the walled Chinese city were ceded to foreign powers, and the British, French, and Americans were free to sculpt the sands of the Yangtze delta into cheap oakley sunglasses idealized forms based on their own European urban models. Shanghai’s rapid growth in the late 1800s left little time for macro-scale urban planning, but the haphazard streets of the former concessions do retain certain features of the European planning principles of the time, best evinced by the broad, tree-lined avenues of the French concession: echoes of Georges-Eugène Haussmann’s urban plan for Paris. 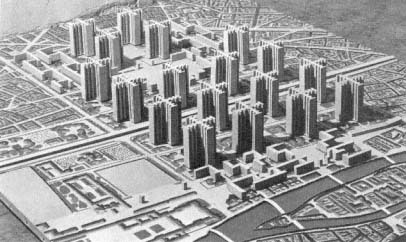 In more recent years, the rapid development of Pudong has followed somewhat outdated Modernist planning principles, allowing automobile traffic to dominate the landscape, concentrating housing and businesses in ever-taller towers, set in questionable “parks.” Pudong as a whole could be seen as a variation of Le Corbusier’s unnerving “Plan Voisin” of 1925. The multi-level separation of pedestrian and automobile traffic (for example, at Lujiazui) could reasonably be compared to Otto Wagner’s proposals for Vienna in the late 1890s, or to Antonio Sant’Elia’s La Citta Nuova of 1914. These modernist proposals have largely fallen out of favor in western planning, and the Pudong experiment shows why – the immense highways and anonymous apartment towers of the district lack the bustling street life that most consider essential for a vibrant, livable city. Shanghai’s urban planners seem to recognize this now, and current plans for the city’s expansion fall more in line with current European and American models. In particular, the recent “One City, Nine Towns” initiative seems to draw equally from New Urbanist town plans (favoring pedestrian-scale urban centers) and Ebenezer Howard’s “Garden Cities” proposal of 1898, in which he suggested a multi-nodal approach to urban development, with concentrated urban cores connected by public transportation lines, and surrounded by unspoiled natural parks and agricultural zones. The Shanghai “Nine Towns” plan can be seen as a development of this model, but with the additional (and frankly quite odd) stipulation of a specific architectural style for each of the new towns: Italian (Pujiang, Pudong District), German (Anting, Jiading District), Swedish/Scandinavian (Luodian, Baoshan District), Dutch (Gaoqiao, Pudong District), American/Canadian (Fengjing, Jinshan District), Spanish (Fengcheng, Fengxian District), Traditional Chinese (Zhujiajiao, Qingpu District), English, and finally the Ecological Town (Lingang, Nanhui District), intended as a model for future development. The nine towns have been built to various levels of completion: some have been canceled or put on hold, some are in progress, and several (Thames Town included) are finished. The towns vary in their adherence to their national themes, but Thames Town (Songjiang, Songjiang District) is perhaps the one that took the challenge most literally, and a stroll through this fake English village makes an engaging substitute for a scroll through Wikipedia’s English Architecture article. The town center is laid out on a medieval street plan, the blocks sheathed in fake-Tudor, complete with decorative half-timbering and stucco infill, punctuated by the occasional neo-Classical façade. The dense streets of the center are alleviated by a large “village green” terminated by a church in late Romanesque/early Gothic style, the thin concrete “stones” of the façade already disintegrating at the edges, revealing the concrete structure behind. Nonetheless, the church (which may or may not be consecrated or operational) makes an ideal backdrop for wedding photographs, apparently a thriving business. Near the village green is a quayside area with faux-industrial buildings and a scattering of “high tech” landmarks, similar in style to the early work of (Sir) Norman Foster. Further out, towards Thames Town’s artificial lake, lies another large public square circled with light-postmodern structures reminiscent of (Sir) James Stirling’s late style, and finally a half-dome restaurant no doubt inspired by Buckminster Fuller’s work in geodesics. Surrounding and radiating out from the town center are a series of suburban blocks, with villas in a similarly eccentric range of “English” styles, before the town merges with endless rows of anonymous high-rise apartments beyond. Though blatantly inauthentic, there is some value to the urban planning strategy engaged here: with no surefire way to generate the kind of vibrant city that grows organically over centuries, copying seems to be as valid an approach as any, and this puts the architects of Thames Town in the same league as architecture’s biggest names. 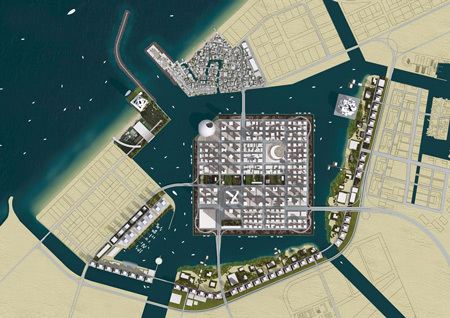 Rem Koolhaas’ proposal for Waterfront City, Dubai, for example, is no more than a collage of New York City blocks and Venetian canals, punctuated by a few key OMA-designed landmarks, and if we are willing to give Thames Town some respect, we can place its design in context with an architectural academic tradition that goes back nearly thirty years to Colin Rowe & Fred Koetter’s seminal “Collage City,” in which the authors argued against grand utopian visions in favor of a heterogeneous, multivalent approach to planning. In the end, Thames Town may be called a failure, due to the poor quality of construction, the numerous “investment” apartments sitting empty, and the lack of commercial activity indicated by dozens of shuttered, vacant storefronts. I believe the low occupancy here can be ascribed to one major factor: the lack of decent transportation connections. In Ebenezer Howard’s Garden City, the network nodes of a multi-center ecological metropolis were tied together into a whole by public transportation links, and it was not expected that any one node could survive autonomously. Thames Town is severely disconnected from the center of Shanghai, requiring a car, a circuitous bus journey, or a long trip on the metro and a short taxi ride to reach. With better transportation connections, I’m convinced Thames Town could grow into a thriving subcenter of Shanghai’s rapidly developing western suburbs. Unfortunately, at present it remains an anachronistic novelty, although an amusing one, well worth seeking out for a taste of the absurd experimental urbanism of modern China. Wow,I didn’t know there’s such area in Shanghai.I like the Tudor’s style house much. -SheShan, Shanghai’s “tallest mountain” is a few km away from the SheShan metro stop. It’s an easy hike to the top through a nicely maintained park. There are a few small temples and pagodas scattered around the hill, and at the “peak” there’s a large cathollic church, built in the 1920s, that’s worth a look. -QiBao “ancient city” is a district of restored old shopfronts bisected by a large canal with several picturesque bridges. It’s a quick walk from the QiBao metro station, and as such is usually packed with tourists, but if you can stand the crowds it is a relatively well-preserved slice of old-china, similar to what you’d see in the canal towns further west. Adding these two to a Thames Town itinerary would make a pretty full day out. I’d suggest hitting SheShan early, pack a lunch for Thames Town (don’t press your luck trying to find an open restaurant there), then hit QiBao for dinner or a snack along one of the crowded food streets. I’m still fascinated by these gigantic ghost towns. It seems like the experience of walking through one of these might be like walking through a giant, 1-to-1 scale model. I feel that saying ‘blatantly inauthentic’ is a bit harsh. From the pictures I have seen, it seems that planners have tried to copy the many different styles that one sees in English Towns, the hodge podge of buildings from different eras and have done the copying pretty well – even if there are issues over quality. Of course it’s going to look inauthentic – that’s partly because it’s brand new and mostly because we know the circumstances around its construction and the whole issue of copying something old. Give this development 50 years to bed down, weather and populate and it will develop its own authenticity. I can’t think of many other countries (most don’t have the money for a start) that would take on a challenge like this. From a purely logistical and technical point of view, I feel the Chinese should be massively congratulated for this accomplishment. Each and every building facade and style has been brought about because of someone’s detailed thought process and attempt to copy something from another very different continent and culture – and I would love to see photos from the other European city copies – I say hats off. This is aside from the whole issue of whether copying is tacky, immoral or whatever. I would love to just go there and explore every street and building – now and 50 years from now – I sure hope it’s not a ghost town then though! Holland Village, with a main street composed of narrow Amsterdam-style facades, and a windmill. 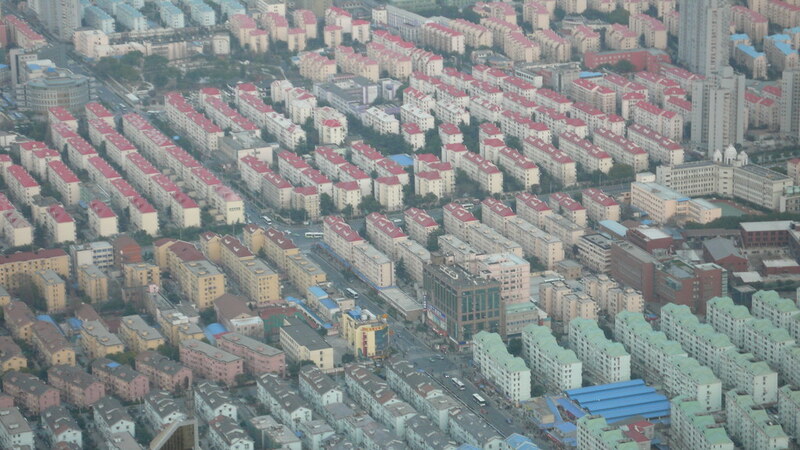 Pujiang (Italian town), done in modernist-rationalist style, but laid out according to traditional chinese urban planning techniques….